Did Democrats stage a fake fight at Ohio GOP rally? Last Thursday, there was a rally in Parma, Ohio for the Romney campaign. The event was headlined by speeches from former Minnesota Governor Tim Pawlenty and Louisiana Governor Bobby Jindal. The event was interrupted by several union and Democrat protestors who began chanting “Pawlenty go home!” during Pawlenty’s speech. These classy folks showed up disguised as supporters, carrying Romney signs and even wearing Romney garb. They deliberately started this interruption in front of media cameras. What happened next was reported by the Cleveland Plain Dealer and instantly went viral among the moonbat left blogosphere. A physical confrontation started as a result of the chanting. But a physical clash between Romney supporters and protesters overshadowed the Parma campaign stop by the prominent pair, who are often mentioned as possible running mates for Romney. 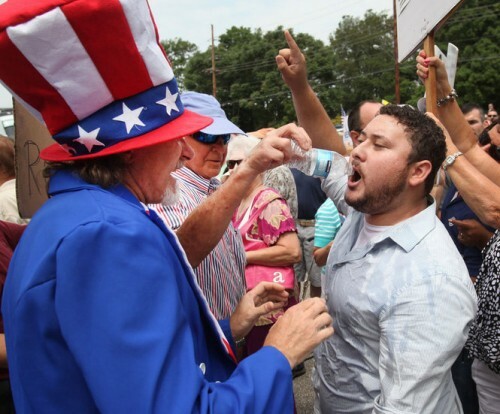 At one point, Romney supporter Richard Brysac of Parma confronted protester Al Neal of Canton, who attended with a handful of members of a group called Fight for Fair Economy Ohio. Brysac, 77, attempted to hush Neal by emptying a bottle of water into the 25-year-old union worker’s mouth. “He seemed thirsty, so I tried to shove the bottle in his mouth,” Brysac said. “I thought it was wrong to interfere with [Pawlenty’s] freedom of speech. When the bottle didn’t work, Brysac pulled out his handkerchief and gagged Neal. Neal removed the handkerchief and continued chanting until the group of protesters was escorted from the rally. The Plain Dealer reported that Brysac (actual spelling is Brysacz) was a Romney supporter, and apparently didn’t investigate any further. However, local Tea Party leader Jim Woods of Medina County Friends and Neighbors did look into what the two men told the press, and what he found casts serious doubt on the genuinity of the entire conflict. First off, Al Neal claimed he was from Canton, but a search of voter records shows that there is no one by that name in Canton or anywhere else in Stark County. In fact, he is a union organizer from Arizona. Second, watch the video again. Doesn’t it appear odd how gingerly Brysacz carefully inserts the handkerchief into Neal’s mouth? And doesn’t it appear strange that Neal accepts it and lets him do it? It looks like he knew it was coming and that he wanted it to happen. It looks like it was staged. And finally, what about Brysacz himself? He told the reporter that he was from Parma. He is registered to vote where he claims he is, and he appears to be as very active voter indeed. As a Democrat. All of this leads Woods to a different conclusion than what the Plain Dealer arrived at. It is our conclusion that both the victim and the aggressor in this confrontation were Democrat actors putting on a sham conflict put on right in front of the TV cameras to distract from Governor Pawlenty’s message and to portray us in a bad light. I wonder how many votes these protestors won with their childish stunt? 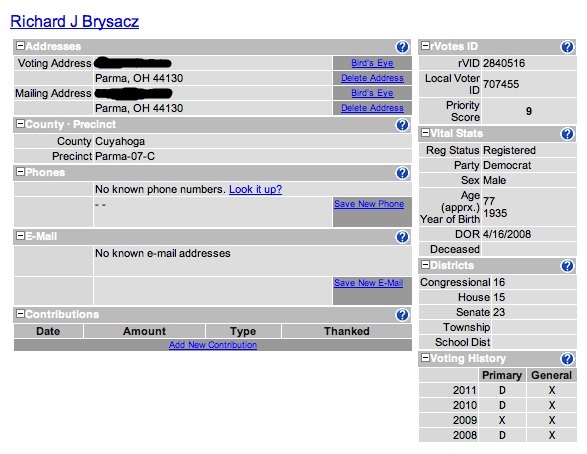 UPDATE: Brysacz is a registered Democrat but has donated to Republicans in the past, so who knows what his story is. The unions hacks who disguised themselves were clearly looking to provoke an incident. The unions have been training their members to engage in tactics such as these, sometimes in coordination with the Occupy losers. Expect more of this as the year goes on.